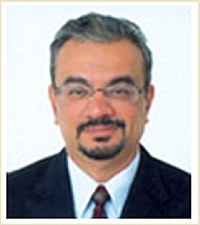 Doctor Ibrahim Galadari is Professor of Dermatology in the Faculty of Medicine, UAE University, UAE in Dubai. He received his MD degree in 1979 from Cairo University in Egypt and completed his residency program there in 1983, later receiving an MSc. H continued his postgraduate work at Wayne State University College of Medicine in Detroit, from which he received a PhD. In 2005, he was awarded the FRCP (Glasgow). Doctor Galadari is Chairman of the Scientific Council of the Arab Board and is a visiting professor at both Boston University School of Medicine and Mount Sinai School of Medicine. He has chaired more than 16 regional and international conferences and has more than 67 published papers in both regional and international journals. He is also President of the Dermatology Society in UAE and a member of many international societies and academies. Locally, he is a chair and member of many medical and social committees in the GCC region.